An RV Rental is a great way to enjoy the outdoors and create wonderful family memories. Vacation RV rentals can help make family travel comfortable, fun, and relaxing. Renting an RV is a great way to find out which RV is right for you before making a purchase too. 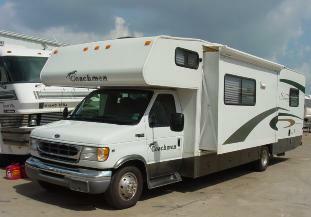 RV Rentals can serve as temporary housing during construction and emergencies. Even movie makers rent RV’s for remote site productions. In the Unites States, “RV rental” is the common term, while outside the US, the term “RV hire” is common. Just about every type of RV is available for rental. From pop up campers to the nicest Class A motor homes, you can pick the RV Rental unit that is right for you. Jump directly to the RV Rental Companies page…otherwise, stick around and see what we think you should know before you rent an RV. The type of RV rental you choose is based on your personal preferences, number of people, and length of stay. Large RVs can be difficult to maneuver for an inexperienced operator so be honest about your driving abilities. Here’s the basic information about various RV’s available for rental. Now that you what is available, and think you know what you may want to rent, read about what we think you should consider with an RV rental. Understand the RV rental company rules and requirements before you sign a contract. Don’t take chances, rent only from reputable RV rental dealers. Obtain a copy of the RV rental requirements and policies about cancellations, security deposits, and additional fees that may be included. Find out about fuel economy. RVs are great for getting away, and you won’t pay for a motel/hotel room, but fuel costs can be substantial…don’t be surprised. Don’t forget RV parks are not free! Verify the RV rental contract includes RV rental fees, mileage rates and miscellaneous fees including pre trip preparations, cleaning, reservations , housekeeping kits and generators. Determine the RV rental dealers policy about reimbursement for mechanical breakdowns and personal expenses during a breakdown. Where Can I Travel With My RV Rental? Depending on your destination, you reserve an RV rental in your area and drive to your vacation spot, or fly to your destination and rent from an RV dealer there. This is very convenient for those wishing to visit distant areas with limited time. Many RV rental dealers in popular locations offer fly and drive packages. RV rental companies require proof of age, and minimum age requirements can vary by state. Make sure you don’t get to where you are renting only to find that you’re not old enough to rent an RV. Of course a valid driver’s license and a major credit card are required. What supplies do I need to bring for my RV rental? Bring your own bedding (check with the rental company for bed sizes) and towels. You can use our RV Checklist Section to help you determine what you may want to bring on your trip. It’s a lot less expensive to take what you want than to buy it on the road. We’ve seen several folks over the years that forgot to bring such basics as soap and toothbrushes. Most RV rental companies offer housekeeping packages which include pots, pans, dishes, and silverware. What kind of insurance do I need for my RV rental? If you already have an auto insurance policy, your RV rental may be covered, but check with your insurance agent to see if you need to add an RV rental policy to your auto insurance policy. You may need to purchase additional RV insurance coverage from the RV rental company. RV rentals are available from thousands of sources throughout the world. How you find a reputable RV rental dealer can be quite easy once you know what type RV rental unit you want, and where you want to rent it. We’ll not go into RV rentals outside North America…there are just too many possibilities for us to address here. However, the USA and Canada have wonderful RV rental units available for just about anywhere you might wish to travel. Consider a fly and drive vacation to Alaska or Canada for a trip of a lifetime. How about taking the family to Yellowstone and Grand Teton National Parks, where you will have opportunities to see some of the USA’s most visited areas? What you need to do next…Click Here for RV Rental Companies.